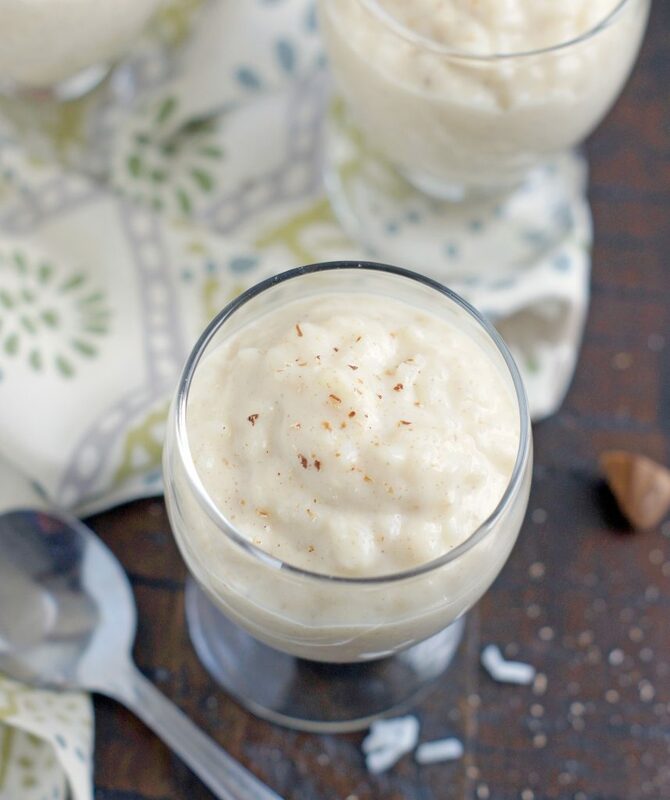 This Rice Pudding has been a favorite of mine since I was a kid. Creamy, silky, not too sweet, comforting and absolutely delicious! I think rice pudding might be one those things that you either love or hate. Am I right? I happen to ♡LOVE♡ rice pudding and there are some days when I have the biggest craving for it (I know, I know, maybe I’m weird!). 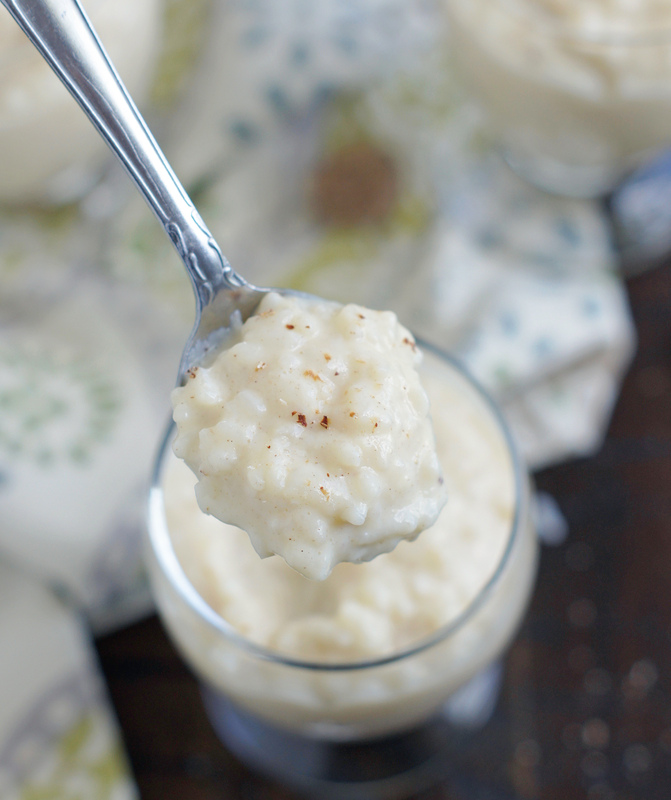 This rice pudding recipe is the one I made all the time growing up. I’ve tried and loved other recipes, (like this one), but this recipe I’m sharing today is my go-to recipe and probably my favorite of all time. Maybe because it reminds me of my childhood or maybe just because it’s so darn good. It’s creamy, not too sweet, has just the right amount of cinnamon and nutmeg and most importantly, HAS NO RAISINS! Well, the original recipe calls for raisins, but I think they’re icky and nasty, and have no business being in rice pudding. Sorry all you raisin lovers out there, but I just can’t stomach them. My mom loves raisins in rice pudding. When she would make this, she’d put raisins in and I was so disappointed. I tried not to gag by the sight of those mushy raisins in that delicious, creamy rice pudding. You’d better believe I would pick them out, every. single. one. Love it, love it, love it! I hope you will too! I always use fresh ground nutmeg, just because I think it is so much better. I also usually add a pinch or two more cinnamon and nutmeg than the recipe calls for. If you are a fan of raisins and want them in your pudding, then place 1/2 cup raisins in a strainer over boiling water to plump up. Stir them in at the end when you add the spices and vanilla. In a small saucepan, scald milks together. In a medium saucepan, whisk together sugar, salt and cornstarch. Add milk mixture and cook over medium heat, stirring constantly, until thick and smooth. Add rice and reheat to a full boil. Pour a little of the hot mixture into beaten eggs while stirring rapidly. Return egg mixture to hot mixture and rice. Stir until thickened (only a minute or two). remove from heat. Stir in spices and vanilla. Recipe Source: The Lion House Cookbook (one of my favorite cookbooks, I got my copy as a wedding gift 26 years ago). I really like Ike rice pudding but never make it. My grandmother used to make it for years but now my Whole Foods makes it fresh at the prepared foods and it is so good. They make different flavor variations but I love the plain. Your version looks great. Do you use Whole milk? Hi Teresa! 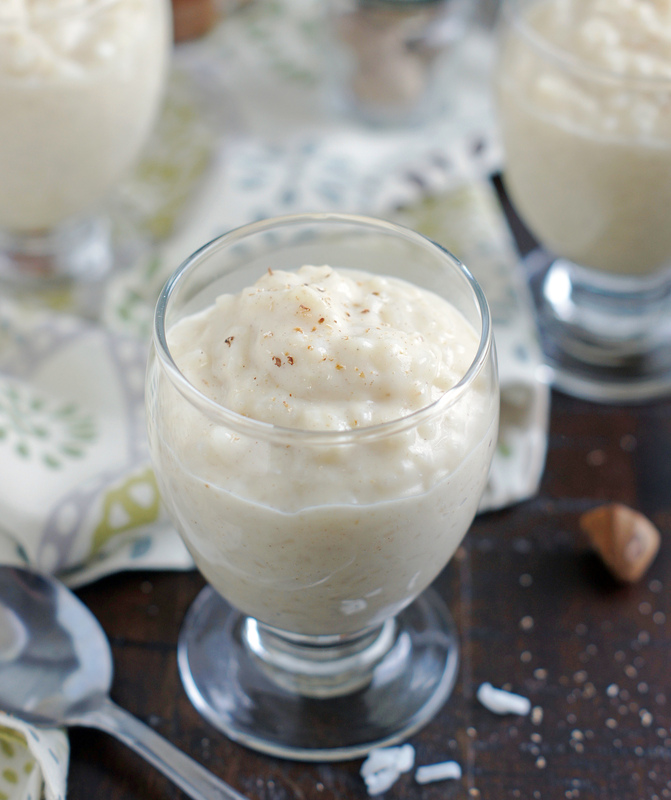 I am so in love with this rice pudding, and I’m sure you will love it too. You can use any milk you’d like. I usually use 1% because that’s what we drink, but I’ve made this before using a combination of 1 cup each of 1% and half & half. Let me know if you give it a try.